Chanelle is no stranger to being broke. Growing up in one of the worst projects in Raleigh, she came up with nothing while praying for a come up. When she hooks up with JaQuez, a dopeboy with deep pockets, she's finally able to leave the hood and live the life she always felt she deserved. 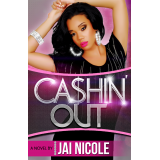 However, when JaQuez does the unthinkable, Chanelle hatches a plan to ensure her financial security and escape her old life. Now in a new city, Chanelle hopes for a fresh start. Meeting a hustler by the name of Trap, she believes she's found a new come up. But when her heart starts to get involved, she begins second-guessing her initial plans for him. Still, Chanelle's not the only one with a trick up her sleeve and those that she s crossed are determined to bring her down. In this cautionary tale set in the dirty south, characters are Cashin' Out for every move made. No one can be trusted, love and lies are closely related, loyalty is a term used loosely, and secrets have the potential to destroy lives.